charge has since been repeated 24/7 on Fox News and picked up over and over by mainstream news outlets as well. The CIA’s collective judgment on Saturday the 15th, when Rice taped her interviews, was that the protests earlier in the week in Cairo — which had been inspired by the video — had also inspired protests in Benghazi. Later, extremist elements hijacked those protests to storm the consulate. The CIA subsequently backed off its belief that there had been protests in Benghazi, but that only happened later. On Saturday, the CIA told Rice there had been protests, and that’s what she said on TV. The evidence to this day suggests that, in fact, the YouTube video did play a role in the attacks. It’s simply not true that Rice invented or exaggerated about that. Rice was, in fact, properly cautious in her TV appearances. The transcripts here are crystal clear. On Face the Nation, for example, she carefully told Bob Schieffer that she couldn’t yet offer any “definitive conclusions,” but that “based on the best information we have to date” it appeared that there had been a spontaneous protest in Benghazi “as a reaction to what had transpired some hours earlier in Cairo where […] there was a violent protest outside of our embassy sparked by this hateful video.” She then immediately added: “But soon after that spontaneous protest began outside of our consulate in Benghazi, we believe that it looks like extremist elements, individuals, joined in that effort with heavy weapons of the sort that are, unfortunately, readily now available in Libya post-revolution. And that it spun from there into something much, much more violent.” When Schieffer pressed her on whether the attack had been preplanned, or whether al-Qaeda was involved, she said directly that we simply didn’t know yet. Death by lack of certainty. The press wants a simple story and just won’t accept statements of uncertainty at face value. Death by complexity. 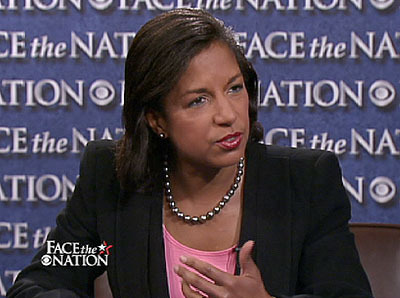 Rice told a multi-part story that the press insisted on simplifying into submission. Death by submission to power. The right wing outrage machine yelled loudly about Rice’s perfidy, and the rest of the press followed along. Death by liberal silence. Liberals did nothing to fight back. Rice was on her own. Susan Rice has been made into a bizarre caricature of herself. The transcripts of what she said are easily available, and by now it’s plainly obvious that her comments were careful, considered, and accurately represented the collective assessment of American intelligence at the time she offered them. It’s time to stop the lynching.